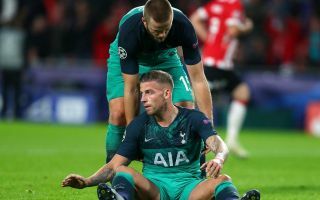 Tottenham will reportedly hand Manchester United the opportunity to seal the transfer of defender Toby Alderweireld for just £25million next summer. In a slightly complicated potential deal, it seems Alderweireld is set to have a release clause written into his new deal once a contract extension is triggered, according to BBC Sport. The Belgium international has been a star player for Spurs despite seeing slightly less first-team action this season and last, and has been linked several times with bigger clubs, most notably Manchester United. The Daily Mirror recently linked Alderweireld as one of the Red Devils’ top defensive targets, and there’s no doubt he’d be a major improvement on basically all of their current players in that position. The 29-year-old will be available for a bargain price as BBC Sport report Tottenham are set to trigger a contract extension with a £25m buy-out clause written into the deal. However, they claim this clause will only be active for the last two weeks of the summer transfer window, so United will have to wait to get their man. It remains to be seen if the club will be patient enough, as they could do with a new defender this January. However, a quality player for that cheap may be worth waiting for.